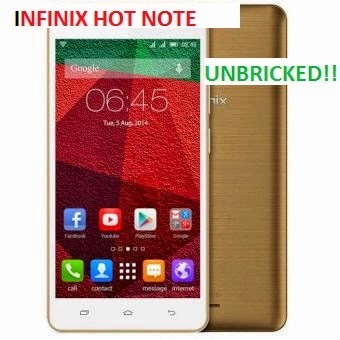 Many infinix hot note users have gotten their phone bricked while trying to install the latest updates. Unfortunately the list keeps on increasing everyday. All thanks to john johnson for uploading his backup. I would have dropped the link to the cwm backup earlier, but almost all those who bricked their device didn’t install a custom recovery before it got bricked and the easiest way to install a custom recovery would have been with the use of rashr flash tool or mobile uncle. but this tools can' be used on a bricked device. So I have decided to put you through on how to install a custom recovery on your bricked device and also how to restore backup. => Infinix hote note scatter file. Download HERE. => Infinix hot note cwm recovery. Download HERE. NOTE: make sure that your device is not connected yet. => turn off your phone and connect it to your pc while holding down the vol + and button. First you have to download your phone's ROM, then you the search option on this blog to search for "how to flash rom with SP flash tool"
I guess the problem is with the driver . Check out this link on how to install adb driver on your PC. And the phone doesn't charge. It only shows the lightening bolt... but it doesn't show the battery percentage. Is this normal? Dude I love you so much(no homo).... I tried the process on another system and it worked.... thanks man.... will I still have cwm recovery or it will return to stock recovery? please bro, what I'm in need of now is the stock boot.IMG..please can you upload it for me separately I don't have enough data to download the full backup...... Thanks in advance. Hey Bro, after pressing download and pressing the vol + button b4 connecting the phone it stil doesnt detect my phone, the phone jst turns on to the "no command screen" and also is the cwm recovery different from the recovery mode its always shwing me wen i put it on cus i didnt install any b4 it got bricked.Pls help!!!!! The problem is with the driver. check out this link on how to install your vcom driver. The first thing you have to do is to install adb and fastboot on your pc by following this LINK. You should see a folder inside named Adb. Hold down your shift key, right click and select "open command window here"
your phone should restart afterward. On the power menu, I had enabled advanced reboot options in settings. When I selected reboot into bootloader, the screen went blank and only displayed "fastboot" and was completely unresponsive. It worked... .. Thanks again... .
thanks sir. you are a saviour. pls i saw something like "sd-ext.img not found. skipping installation of /sd-ext." and how do i unroot the device, b ecause it looks like the recovery file is from a rooted device. will a hard reset harm the device in any way ? It simply means that there was no app installed on sdcard when the backup was made. If it's kimguser, click on the settings icon and scroll down to remove root permission. Please, i love this your post & i really wanny ask few questions here. I just bought my Infinix hot note. B4 doing anything, i updated it. After all the updates, i then rooted it using KINGROOT APP. Should i UNROOT using KINGROOT, after d unrooting, den uninstall the KINGROOT APP then proceed with the UPDATE. NOTE PLS, i ve flashed in CUSTOM CWM into the Infinix hot note. To avoid md5 error, its advisable you extract them all..
.android_secure.img not found. Skipping restore of /sdcarcard/.android_secure. .andriod_secure.img not foud. Skipping restore of /sdcard/.andriod_secure. skipping of those files is normal. both while restoring did you see anything like Restoring system....? And also did you try rebooting after you got the Restore complete message. i will advice you to delete the extracted files and re extract all over again. For the back menu button disabled ish, just keep on scrolling and iw will be enabled. if you have a working infinix hot note, then check out this LINK on how to create the rom backup. after unbricking and unrooting, i tried to system updates again and my phone got bricked. this time, i cant even power on and the charging icon has dissappeared. in fact no sign of light on the screen. it has been like this for over 6 hours. please any way out ? @anonymous since you rooted your phone with kingroot app, to unroot it, you have to use kinguser. And also Note that you can not update your phone with custom recovery, you have to re install the stock recovery. What you need now is your phone's firmware. Click on this LINK, register and request for permission to download the stock ROM by commenting on the post. After downloading it, Click on this LINK for procedure on how to flash it to your phone. thanks buddy, though it came with someones usage info. thanks bro. i tried running the restore on the phone but kept getting "MD5 mismatch" any help? insert the memory card into a working phone..
open the file with any note editor and delete all the whole characters inside. How do I know that my infinix hot note is bricked. Because the only thing I noticed is that some game apps are showing in netqin app manager to be uninstalled but I Couldn't c it in my main menu. wats d way out pls?? Bro pls. I want to do OTA update on infinix hot note afta a successful unbricking with a cwdmod backup restore.... Now I have a cwd recovery and can't install update.... How do I reverse to its stock recovery?? And can I still update after then?? Or is it advisable to fashy the update?? on 1st, usually i do install cwm temporary with command "fastboot boot cwm.img"..
hi bro, i have followed ur instruction above. when i try to download stock recovery from sp flash tool, suddenly it said "failed.....bla bla(i cant remember it) and then my hot note cant turn on at all, how can i fix it? hi bro, what up with the infinix x551 hot note not accepting the privacy protection code despite it being the correct one. i have tried but its still refusing to accept it. what should i do? Pls boss is their anyway I can restore my stock rom, right now my phone is running on custom rom called comfort rom. Thanks, I have downloaded backup you uploaded 1.07g. After flashing the stock rom and getting a success message,my phone still doesn't come up at all.Please what's the solution? my infinix hot 2 x510 is locked with pin and i dont know what to do. please how can i solve this problem. You mean as in phone lock ...?? Dude... I mistakenly booted into fastboot mode.. now I cant hard reboot my phone by holding the power button for 15secs. My phone has been stuck in fastboot mode. scroll through the comments above, I actually posted a solution for someone and it actually worked for him. I am having problems booting into recovery using your recovery image but I got one that works. I got to the Recovery Menu but there was only Install update from SD and Restore Userdata. Thank you... . It's working now... How can i unroot and reupgrade to lollipop? Bros what will i do after i restored the stock recovery image, my phone still wouldn't install update. 08038261949, pls what should i do? To upgrade to lollipop you actually need a PC.... You can't do that via system update. pls bosses, whenever i turn on my phone..it hangs and restart itself..after bootng it shows app permission running, hangs and reboot again...pls what can i do? First let the battery drain completely, then download the Full firmware and flash it with sp flash tool. You mean you need the download link....? Don't worry just leave the phone for a couple of hours for the battery to die off completely ( I usually recommend 24hours). After that you have to restart the procedure all over again..
Sup brother. Please I was upgrading my hot note into lollipop with sp flash tools and since then my phone didn't come on... Please what can I do.. It's been over 3 days now. Did the upgrade finish successfully or there was an interruption...? Please help me, i am stuck at fast boot, when I try to install adb that you mentoned above in comments, it doesn't install, it says 0 files copied. I have this infinix x600.I change my chip and when I on it is asking for privacy protection code.I have send it to many places but still I can't open it.Can you help me out? Mr Yomi thanks for your prompt responce. pls i just flashed my infinix x551 with sp flash tool and it was successful showing the ok sign.after flashing it shows a sign of battrery charging for once when connected to pc. After that display it has not been coming up or booting again. Hw do I rectify this ? Bro. Your phone has bricked again. I suggest you follow the unbricking process explained above. And will be better if you can get a stock lollipop rom instead of the Kit Kat rom posted here. So that you won't need to go through the process again to update to lollipop. And make sure its the right rom you are flashing. The problem might be the USB cable you are using, the USB port or a software issue. Pls help me Mr. Yomi. I was flashing my infinix hot note 2 (X600) some days back when it got interrupted at about 77%. Since then I have left the phone uncharged for 2 days and have also tried charging both with DC and laptop charge still it doesn't show any form of life and still it is not recognized by several other systems so I can reflash. I have tried installing different USB drivers all to no avail. Pls help a brother in trouble. Thanks. Hi Yomi. I hope you can help me out. My Phone is Infinix x551 (16+1 L).I had run an OS upgrade and then it had invalid IMEI. I rooted the phone and tried to fix the IMEI with no success. Then I tried to flash the phone with this ROM X551-G808-A1-L-20151218. The Flashing process completed and the OK tick appeared. But my phone is dead for two days now. What do you advice me to do? I guess you flashed the wrong ROM. Just leave the phone for like a day without charging it at all. After that,get the latest lollipop ROM for your phone and flash it with the normal. Thanks Yomi, my phone is Infinix x551 (16+1 L). Can you give me a link to the correct Lollipop ROM so that I dont make the same mistake again. Hope you clicked on download before connecting the cable!? My phone itd ROOT INFINIX X551. First my phone flashing because bootloop, in flashtool it succeed until emerge green checklist, but my phone even does not light at all(DEAD). I concluded that it was bricked. Then I try your way above. I get a problem when usb plug appears "USB NOT RECOGNIZED". Whereas I previously flashing out and usb was read, and now not read. May i ask the firmware download link for hote note x551? Is yours Infinix hot note pro or just the regular hot note (I mean is it 2gb or 1gb RAM)!? Am a big fan of your site and it has help me a lot but right now, am in a deep problem and am confused. I tried flashing a twrp recovery using spflashtool but after that, my phone refused to boot and will not charge. I am using an infinix hot note pro x551. even when I connect to my pc, it won't recognize. I have tried different pcs but still will not recogniz my device. Is there any way to revive this phone? you are my only hope. Please, i need your procedure. My hands are even shaking as i am typing to you. Please, I await your quick response. Your phone is probably just stuck in Meta Mode. Just leave it for like 24 hours for the battery to die off completely then connnwc your charger to it afterwards to see if it will come up or you can equally connect it to your pc..